President Obama spoke in Chicago on Tuesday night after winning re-election. [*] SCHIEFFER: Good evening from the campus of Lynn University here in Boca Raton, Florida. This is the fourth and last debate of the 2012 campaign, brought to you by the Commission on Presidential Debates. SCHIEFFER: The audience has taken a vow of silence — no applause, no reaction of any kind, except right now when we welcome President Barack Obama and Governor Mitt Romney. This is obviously an area of great concern to the entire world, and to America in particular, which is to see a — a complete change in the — the structure and the — the environment in the Middle East. With the Arab Spring, came a great deal of hope that there would be a change towards more moderation, and opportunity for greater participation on the part of women in public life, and in economic life in the Middle East. But instead, we’ve seen in nation after nation, a number of disturbing events. Of course we see in Syria, 30,000 civilians having been killed by the military there. We see in — in Libya, an attack apparently by, I think we know now, by terrorists of some kind against — against our people there, four people dead. Our hearts and — and minds go out to them. Mali has been taken over, the northern part of Mali by al-Qaeda type individuals. We have in — in Egypt, a Muslim Brotherhood president. And so what we’re seeing is a pretty dramatic reversal in the kind of hopes we had for that region. Of course the greatest threat of all is Iran, four years closer to a nuclear weapon. And — and we’re going to have to recognize that we have to do as the president has done. I congratulate him on — on taking out Osama bin Laden and going after the leadership in al-Qaeda. But we can’t kill our way out of this mess. We’re going to have to put in place a very comprehensive and robust strategy to help the — the world of Islam and other parts of the world, reject this radical violent extremism, which is — it’s certainly not on the run. 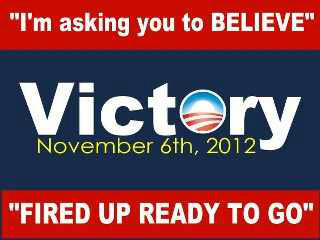 President Obama Has A Double Digit Lead In Ohio Early Voting! Hammer Time!! Let’s Go! CROWLEY: Good evening from Hofstra University in Hempstead, New York. I’m Candy Crowley from CNN’s “State of the Union.” We are here for the second presidential debate, a town hall, sponsored by the Commission on Presidential Debates. CROWLEY: And because I am the optimistic sort, I’m sure the candidates will oblige by keeping their answers concise and on point.